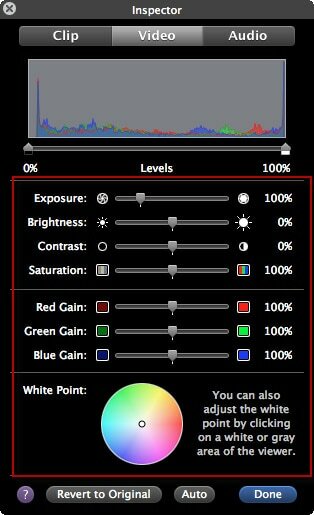 Advanced color tuning features to adjust white balance, HSL, vignette, light, etc. The cameras are more and more popular in our daily life, especially when you travel to some places. Today the cameras make it very easy for you to get some good quality videos and photos. But sometimes, the auto focus camera may misread the brightness or balance of the environment and your work get a not good-looking or natural color. At this time, you want to correct the color of your photo or video to get true colors under different lighting conditions and boost weak colors. Go to File > Import Media or just drag and drop your videos from iTunes library, Photo Booth, etc. You can also use the capture device or the built-in iSight to capture video. Place the video onto the timeline and double click it. 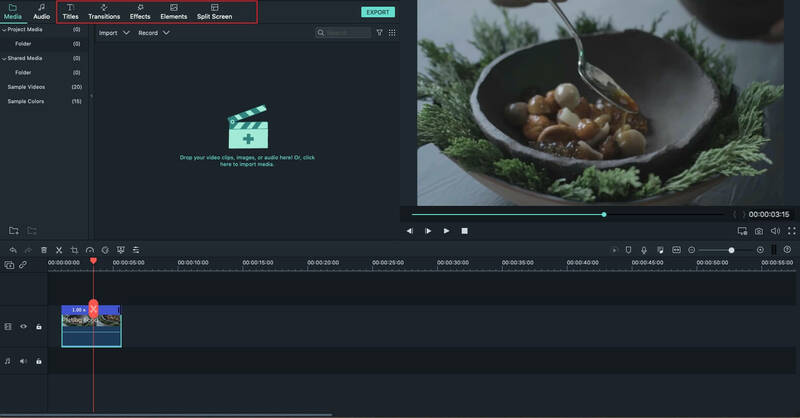 In the pop up Video Inspector, you can easily adjust brightness, contrast, saturation and hue of your video. There'll be real-time preview result shown in the right. If the you're happy with the effect, hit "OK" to confirm your settings. When everything is OK, hit "Export" to save or share your video. You can either directly share your works to Facebook or YouTube or save to local disk and mobile devices. What's more, you can also burn to DVD. 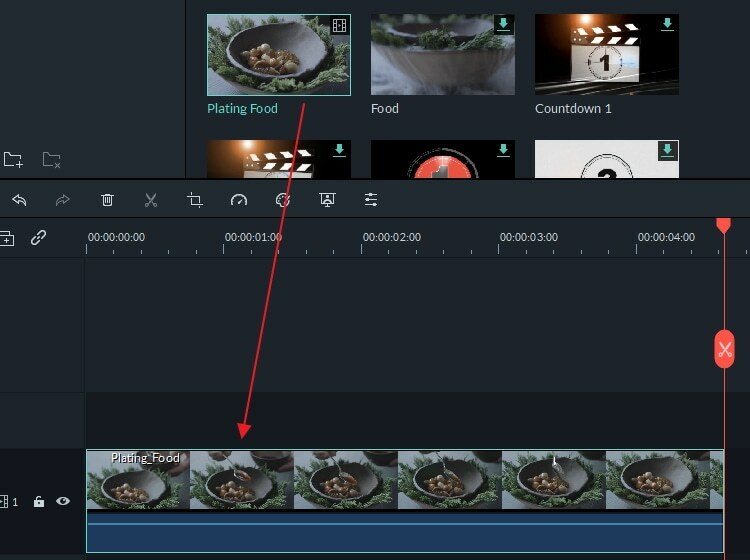 To use iMovie color correction, you must turn on Advanced Tools. You can do this by going to iMovie Preferences > General, and then you will see a window as below. 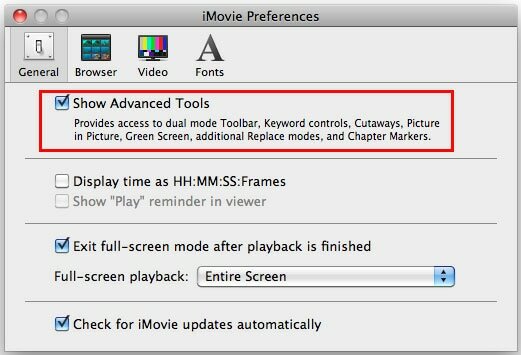 Select "Show Advanced Tools" to turn iMovie color correction on.. 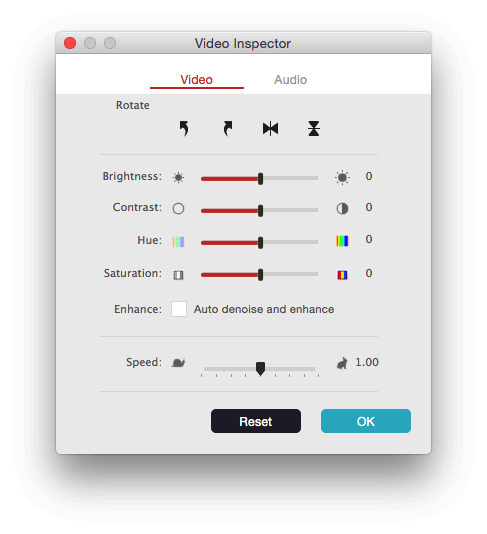 In the Inspector, choose "Video" tab and in the following window, you can change and correct video color as you like. Here you can adjust the exposure, brightness, contrast, saturation, red gain, green gain, blue gain and white point. You can real-time preview the effect in the viewing window. When you are satisfied with the effect, hit "Done" to save and finish the video color correction in iMovie.